Tee Hee. Tor brought home this friendly sock puppet recently & I have to say I love it. Usually, I’m not a big fan of those weird foam shapes they sell at craft stores (I know this is odd, but I really can’t stand the texture), but this time I like how they worked out. All you need is a sock, some yarn for hair, shapes for the face, and glue to hold it all in place. Sock puppets are the greatest. I love the foamy eyes, too cute. I’m a mixtress not a sock-puppet-maketress. 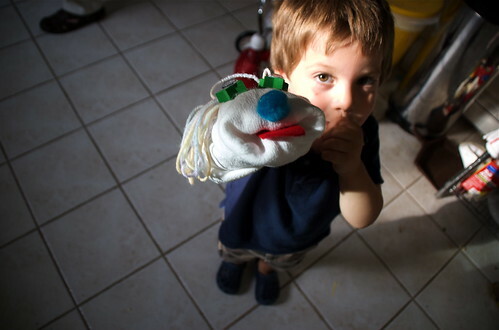 Please show me how to make a sock puppet. I’d love to make one for my daughter she’d love it! i love you. thanks for the idea. im going to go and beat my child HARD and in the face, then we are going to make sock puppets.